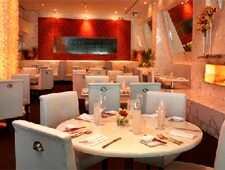 Matured as a French-Asian restaurant that delivers more than glitzy style---the discerning diner is welcome. : Oya has evolved into more than a glitzy backdrop for the über-cool social scene. Indeed, the décor of white leather and marble blends with pizzazz against a striking chain-link curtain to go with the floor-to-ceiling Capiz shells. In the French-Asian genre you have small and big plates, and sides are referred to as micro plates. Apple-jícama salad is a refreshing starter, and may be followed by the chef’s pork ribs with a selection of soy, barbecue or ginger accents, or the comfortably rich Peking crêpes with duck confit. For a finale-like small plate, try the rather straightforward herb-crusted lamb with coarse grain mustard to complement the rich meaty bites. Oya is all about options, with a filet or the scallops with pad thai noodles available as big plates. Add in a sushi menu, a prix-fixe meal, and an ambitious, enthusiastic sommelier and dinner can be an adventure. There is an enlightened saké line-up, too, that adds another dimension to the beverage program. From day one, the best dessert has been a banana bread-and-butter pudding with rum raisin ice cream and caramel sauce. It’s still true today.